When grandmother math recently retired as a school teacher (for the third time) she found among the mountain of math manipulatives and hands-on science materials that she had accumulated, a bag of Cartesian divers dressed up as squids. to view the first Cartesian diver post. I gave of couple of the squids to friends Jesse and Salina to show to Faith, their three-year old daughter (see previous post, Mixing Stuff Together is the Beginning of Chemistry, October 2013). They put the squid in a 2-liter bottle filled with water to find out if Faith could squeeze the bottle with enough force to make the squid dive for the bottom! As shown in this picture, she can! Watch this short video of Faith interacting with the Cartesian diver. Faith's small hands makes it easier for her to apply pressure to the bottle by placing her hands on its dome-shaped top. Note that when she tries to sink the diver by pressing on the sides it is harder for her but, after several tries, she is still successful in sinking the diver. The sensitivity of the diver to the force exerted on the bottle can be controlled by the initial amount of water in the barrel of the diver. Remove the rubber cap from the dropper, plug the small end with a finger, and use a second eyedropper to add water to the barrel. Test the buoyancy of the diver in a tall glass of water. Add enough water to the diver so that it just floats. 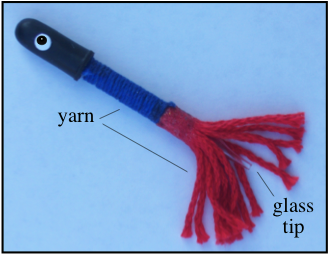 I have not been able to find a source for the squid seen in Faith's video but I have made a squid-like Cartesian diver by gluing colored yard to the barrel of a glass eyedropper and then wrapping the barrel with yarn of a different color. The yarn traps small air bubbles so you have to swish the diver back and forth in water to release the bubbles. The modern super-glues make it easy to attach yarn and small figures to the barrel of the eyedropper. Glass eyedroppers have been largely replaced by plastic droppers but I much prefer the glass. Six glass droppers can be purchased for three dollars from this science supply retailer. You can use a plastic eyedropper but you will have to weight the end by wrapping wire around the barrel to get the dropper to float vertically. If you would like to view a wide variety of Cartesian divers click on the following link. 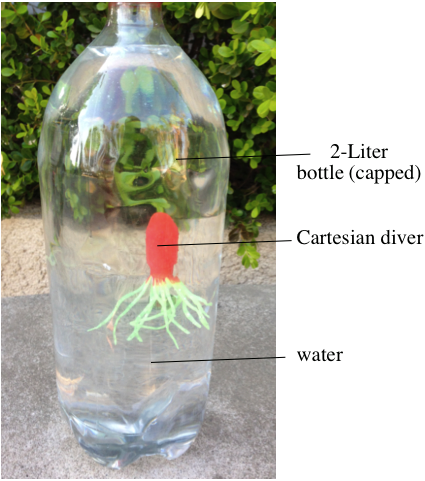 Also, when you visit the link, be sure to download the free colorful PDF document that describes the science concepts you can teach older children (or learn yourself) using a Cartesian diver. 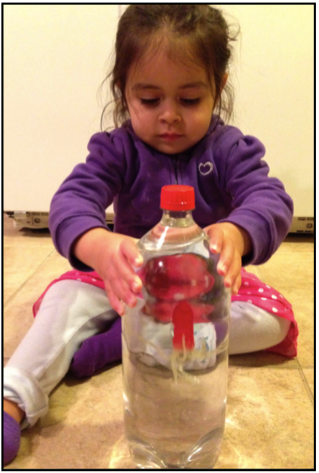 The Cartesian diver is an interesting object that children like Faith enjoy because they can control its action. It's so important that we as parents and grandparents continually nurture the curiosity about the natural world that children are born with. Thanks again to Jesse, Salina, and Faith for sharing the video and pictures.